Fish are sensible beings who form mutual bonds and have the ability to feel pain and fear, just like humans, dogs, cats, and other animals do. Billions of intelligent, complex animals are killed for human consumption. 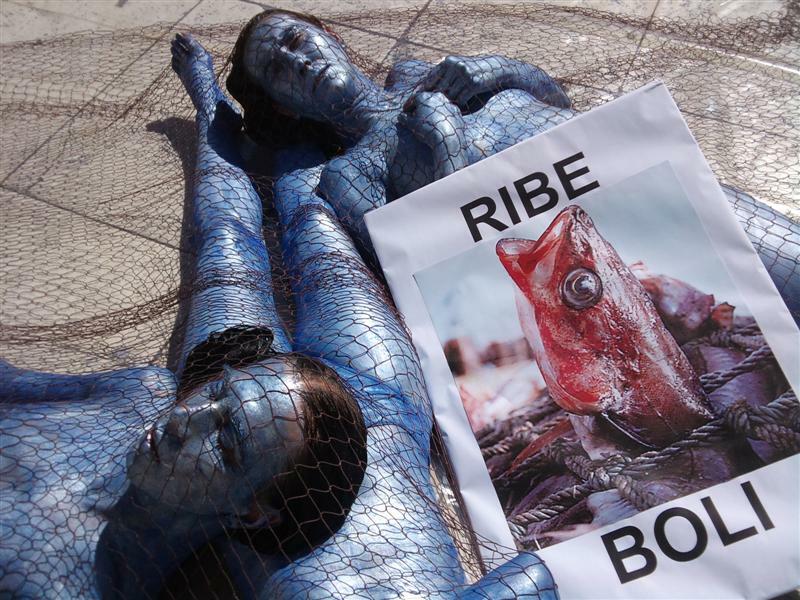 Fish are speared, squeezed or butchered in order to cut out their intestine while they are still fully conscious. 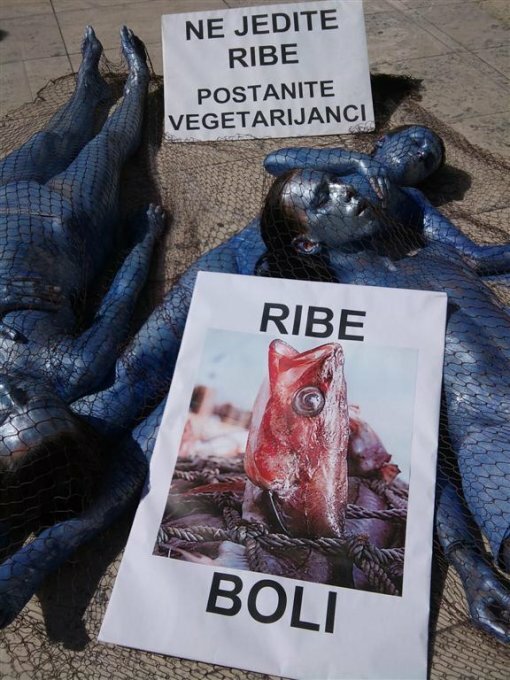 Nobody acknowledges the agony of fish, they are reduced to "swimming vegetables" whose value is measured in tons. Their living habitats are mercilessly devastated, and the number of individually killed animals is beyond our comprehension. Animal Friends' activists will hold a performance on Thursday, September 2, at 11 A.M. on Narodni trg in Zadar near the information stall. 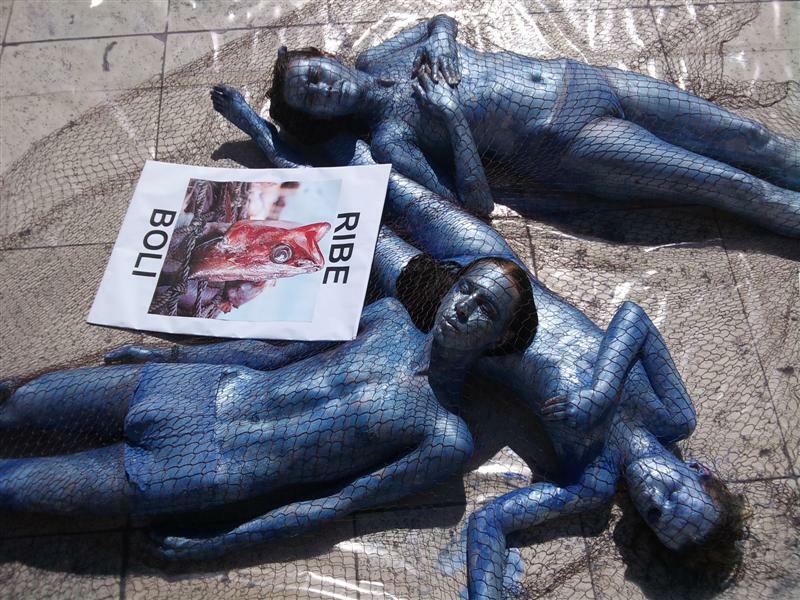 With this performance they want to bring attention to the suffering of fish and the devastation of the seas. Undressed and entangled in fishing nets, activists are calling for an environmentally-friendly and ethical diet. Due to over-fishing, thousands of living organisms necessary to maintain the ecosystem are exterminated. Commercial fishing of sea animals and shellfish have devastated the ocean’s ecosystem to the extent that today oceans and seas are ghostly nothingness, which barely remind on times when they were full of life. 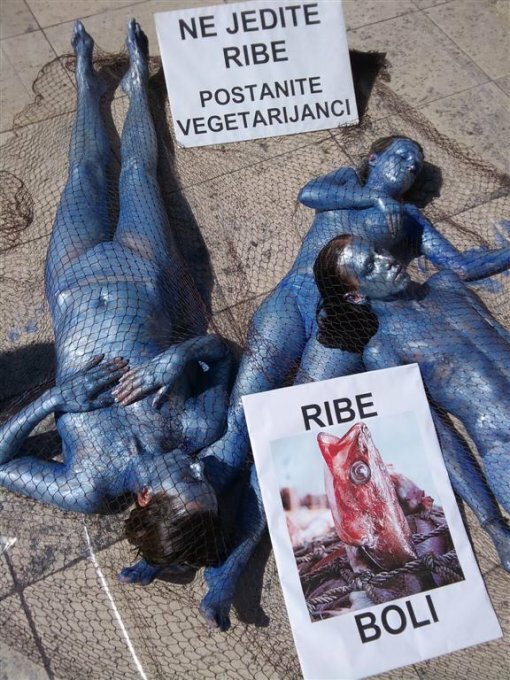 Croatia not only devastates the Adriatic Sea with trawlers, but also pollutes the environment with underwater farms and destroys the seabed, which therefore becomes a desert in which no life is left. Fish on aqua-farms are exposed to intense congestion and unnatural conditions, which cause the emergence and spread of infections and parasites. Aqua-farmers use antibiotics and hormones in an effort to make them grow faster. By measuring the level of mercury, arsenic, lead, and cadmium in fish, crabs and shellfish in the Adriatic Sea, it is confirmed their significant pollution. Fish, due to the excretion inability, retain heavy metals in the body, which is caused by human pollution of the sea. Several thousands of people die every year as a result of fish and shellfish poisoning. The World Health Organization has advised women of childbearing age and young children not to eat tuna and mackerel because they are known to contain alarmingly high levels of mercury, which is proved to damage the developing brain of a fetus and young children and also the brain functions of adults. Fish, as well as meat of other animals, contains cholesterol. Plant based sources of Omega-3 fatty acids are a much healthier option. Meat of fish is often considered part of the a vegetarian diet, which is completely wrong. 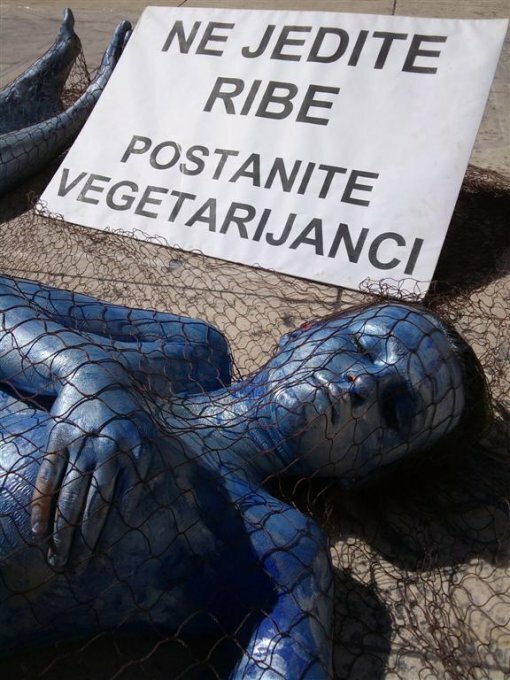 In the European Parliament a newly passed amendment, which for the first time gives the legal definition and protection of the term "vegetarian" and "vegan," was recently put into effect. 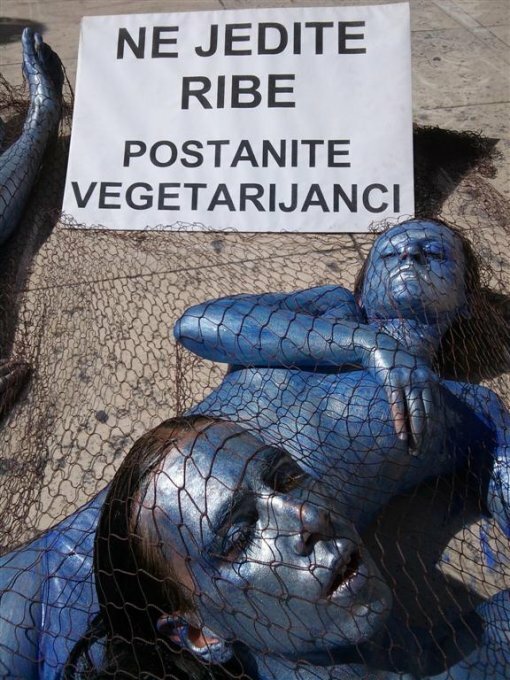 This amendment excludes the use of terms such as pesco-vegetarianism and guarantees that products labeled as "vegetarian" do not contain any products derived from any kind of animals, including fish, and those labeled as "vegan" do not contain any animal based products, such as milk, eggs and honey. 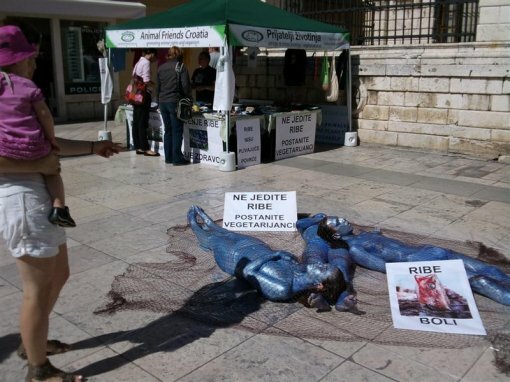 Animal Friends invites the people to stop eating the inhabitants of lakes, rivers, seas and oceans and to consider going vegetarian or even better vegan and thus prevent the killing of animals, destruction of the environment and preserve their own health.